It's gorgeous, durable, and comfy to sit on, but is it possible that you are ruining your leather furniture without even realizing it? Avoid these common leather furniture mistakes. The placement of furniture in a living room is often done with a thought towards convenience and visual appeal. If you've placed a piece of leather furniture too close to heating vents or any type of heating unit, though, then you risk damage to your leather furniture. Heating vents, radiators, and space heaters can dry out and ruin leather furniture with prolonged exposure. In addition, exposure to sunlight can fade and damage your leather furniture as well. What you will end up with minimally is discolored patches on the furniture. But the worst-case scenario includes cracked and dry parts of the furniture that begin to break and pull away. Magazines, newspapers, and even some books can bleed onto leather furniture when left in contact. Although furniture is a convenient place to leave reading material, you may end up with an extra copy of the print that you would never have wanted. This is especially true of magazine pages with their vibrant colors, or coloring pages that have crayon on them. It's best to avoid leaving items on the leather for any extended period of time. Leather is admired for holding its shape so effectively, but that can leave owners a little more negligent in fluffing and turning their cushions. Wrinkles that develop in leather couches can be impossible to fully fix. The best bet for owners of leather couches is to turn and fluff cushions weekly. Leather furniture needs to be dusted weekly. Whether owners choose to use a dry microfiber cloth or opt for using the brush attachment on their vacuum cleaner, the key is weekly attention to the dust on your leather furniture. Dust is an enemy of many things, and leather is included on the list. Luckily the damage is easy to avoid with just a little bit of regular weekly cleaning. 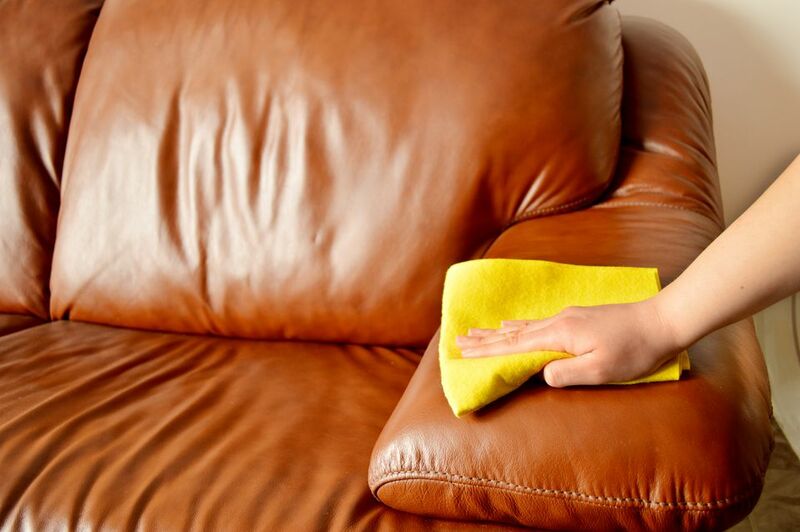 Leather owners should avoid soaps and detergents, sprays, oils, and polishes that may damage their leather furniture. Follow manufacturer's instructions carefully and when in doubt, call in the professionals. Most of the time a dry cloth, or well cared for cleaning cloth and lukewarm water are all that is needed. If you need something stronger, get some advice from the manufacturer of your furniture. Check the tags on the furniture, check the company website, email or call customer service, but don't use a product that isn't recommended and take a chance on ruining your furniture.